Tagged associated press news, Bangkok, carabinieri agents, drugs, Extradition, Italian authorities, italian mafia, Italian mob, laundering money "boss of bosses, mafia ring, money laundering, Pizza Connection", Roberto Palazzolo, ROME (AP) mafia, Sicilian carabinieri, Sicilian Cosa Nostra, Sicilian mafia, Sicilian mafia banker, social media, the "Pizza Connection, Tommaso Buscetta, Vito Palazzolo, Vito Roberto Palazzolo, Vito Roberto Palazzolo Mafia association. Rome. A fugitive Italian banker implicated in the “Pizza Connection” drug and money laundering trial has been detained in Thailand after Italian authorities tracked his whereabouts on Facebook. Italy’s highest court in 2009 upheld the 2006 conviction and nine-year prison sentence against Vito Roberto Palazzolo for Mafia association. Palazzolo’s lawyer, Baldassare Lauria, said on Saturday his client, now a South African citizen, had been detained by Thai police at Bangkok’s airport on an Italian extradition request. The lawyer said his client plans to fight extradition. Thai police were tipped off to Palazzolo’s whereabouts by Sicilian carabinieri agents (National Military police) who had been monitoring Facebook and other social media postings by Palazzolo and his family, the carabinieri said in a statement. The “Pizza Connection” investigation broke a $1.6 billion heroin and cocaine smuggling operation that used New York pizzerias as fronts from 1975 until 1984. Palazzolo acknowledges that in 1982 while working as a banker in Switzerland he returned about $6 million in funds to the Mafia after being threatened by the mob. He said he was made a scapegoat in the “Pizza Connection” case since he was a lone Sicilian working in Swiss banks that were accused of laundering drug money for the mob. 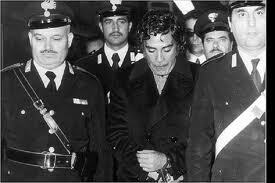 Palazzolo changed his name to Robert von Palace Kolbatschenko in the 1990s but denied it was to sidestep the law.